Blue/Island: Knowledge, manipulation, wind, and wave, these are the blue mage's tools. Islands provide blue mana, where mystical merfolk are dwarfed only by the humongous krakens that dwell in the deep sea. Whilst high in the endless sky battle mages bring forth deceit, illusion, and logic upon their foes. Black/Swamp: Death, ambition, and darkness are the stock and trade of black mages. Black mana is drawn from dank swamps, where vile Demons, treacherous Vampires and hordes of Zombies inhabit the shadowy wastelands, haunted catacombs, and fetid bogs. Red/Mountain: Freedom, fire, and impulse are the lifeblood of every red mage. Red mana flows from rugged mountain ranges, rocky crags, and the fiery heart of volcanoes. Goblins, Giants and Dragons aid the red wizard bringing forth fury and passion to incinerate all those who stand before them. Green/Forest: Strength, ferocity, and life, these are the values that sustain the green mage. The teeming forests overflow with green mana, bringing forth unimaginable beasts, the graceful elves, and aged treefolk. Green magic is about growth, life, and brute force. Booster Packs: Include 15 cards to add to your collection, with each pack containing one rare/mythic rare, three uncommons, ten commons, a random basic land, with a chance of a premium foil card. Eternal Masters always includes a premium foil, however this set is extremely limited in production, and will sell out fast. Booster Boxes: Consist of thirty-six 15-card booster packs and are ideally suited for those who are looking for a large collection of random cards from a newly released set. ​Bundle: Formally known as a Fatpack now includes ten 15-card booster packs up from nine, a player’s guide with pictures of all cards in the set, 80 basic land cards (16 of each), one artistic card box, two cardboard deck boxes, a learn to play insert, and a special edition life counter dice. Commander: Is a multiple player format which each player’s deck is led by the legendary creature of his or her choice. The rest of the 99-card deck is a specially crafted arsenal of creatures, artifacts, and other spells for which are all restricted to one of a specific named card (does not include basic land). Best enjoyed as a Free-for-all game among 3 to 6 players. The game is a freewheeling back-and-forth battle in which alliances are formed, friends are betrayed, and grudges are repaid with vengeance. ​Deck Builder's Toolkit: Jump-start your collection with 285 battle-tested cards, perfect for building several different decks! This box includes a guide containing dueling tips and expert advice on how to custom-build the deadliest and most effective decks possible. Each toolkit has 125 semi-randomized cards, four 15-card booster packs from a variety of sets, 100 basic land (20 of each), and full-art reusable card storage box. Elves vs. Inventors - Gather a massive clan of elves bent on demolishing all mechanical threats, or assemble a squad of inventors dedicated to unleashing the potential of destructive gadgets. 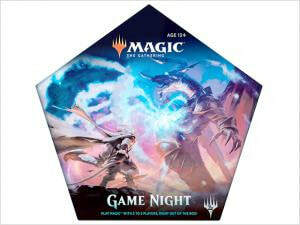 Game Night - Is an out-of-the-box introductory multiplayer Magic experience—a way for an engaged Magic player to introduce friends to the game, or for gaming groups to have their first Magic experience together. What Planeswalker Decks are to one-on-one, Game Night is to multiplayer. Ravnica Allegiance Guild Kits - 60 card deck assembled from all three Ravnica blocks, plus special basic lands. Also includes pin, deck box, sticker, and spindown life counter. Available as Azorius, Rakdos, Simic, Orzhov, and Gruul. Planeswalker Decks: Acquaint players who are interested in Magic with basic strategy, plus the game's settings and characters with a foil Planeswalker card not found anywhere else. Contents: 1 ready-to-play 60-card deck featuring a foil premium Planeswalker card, 2 booster packs, 1 strategy insert, and 1 Magic learn-to-play guide.